After a day of protests against the inauguration of President Serzh Sargsyan in what his challenger Raffi Hovannisian said would mark the ‘dawn of a new Armenia’ it has become clear that the opposition leader will try to take his supporters along the path of a long struggle, including rallies and other actions. At least this is what is prompted by some of his statements addressed to supporters in Liberty Square just before making a failed attempt to lead a march past the Presidential Palace in Baghramyan Avenue, where heavy police cordons had been put up. Whether Hovannisian can quickly reshape the immediate goals of his movement after failure to stop Sargsyan from taking what the opposition leader claimed was a “false” oath of presidency before the nation will now depend on how successful will be his efforts to overcome the sense of disappointment that a considerable number of opposition supporters seemed to have last night after a number of controversial events. Many participants were clearly perplexed at the decision of Hovannisian to leave them in Baghramyan Avenue amid a continuing standoff with riot police and lead part of protesters towards the Armenian Genocide Memorial at Tsitsernakaberd via a different route and in the company of Chief of Armenian Police Vladimir Gasparyan. Interestingly, Tsitsernakaberd did not feature in the plans of the opposition as a point toward which they could stage a march on April 9. 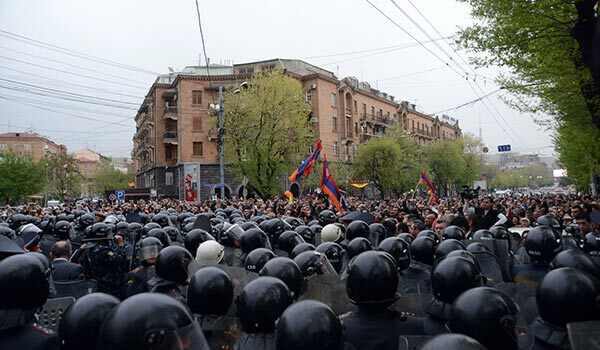 It was also known in advance that Yerevan authorities did not allow the opposition to include the section of Baghramyan Avenue, where the Presidential Palace is located, in the route of their march, explaining that an official event would be held there simultaneously. Hovannisian, his wife Armine, Heritage Party members Armen Martirosyan, Stepan Safaryan, Heritage faction lawmakers Tevan Poghosyan, Ruben Hakobyan and former presidential candidate Andrias Ghukasyan walked arm in arm up the avenue. But they and the protesters led by them were met with several rows of police cordons at the beginning of the boulevard. A standoff began with some scuffles in which some protesters reportedly suffered minor injuries. Heritage member Martirosyan also suffered a broken nose and was reportedly taken to a clinic for medical treatment. Then after negotiations with Police Chief Gasparyan Hovannisian led a group of supporters, about 3,000 according to ArmeniaNow’s estimates, towards the hilltop memorial via a different route that included Saryan Street and Victory Bridge. ArmeniaNow noticed, however, that some of the protesters did not go all the way to the memorial as they separated from the marching crowd. Some were apparently too tired after doing a lot of walking during the day. The hardliners, as well as those who apparently were confused and did not know what was happening, still remained locked in a standoff with riot police in Baghramyan Avenue. Among those who stayed in Baghramyan Avenue was also Heritage MP Zaruhi Postanjyan, who was calling on people to move back to Liberty Square, but would not listen. And former presidential candidate Andrias Ghukasyan, who joined the Hovannisian-led protests after the elections, suggested starting a sitting strike, but he was taken to a police station from where he was released later. Among those who remained in Baghramyan Avenue were also representatives of the Sardarabad civil movement, Karabakh war veteran Jirair Sefilyan, film director Tigran Khzmalyan and others. Sefilyan stated: “Raffi [Hovannisian] went to Tsitsernakaberd without telling them about it while they did not need to go there.” And Khzmalyan qualified Hovannisian’s step as ‘political suicide’. “I could not imagine such a way of neglect. We have long been offering to Raffi [Hovannisian] an alternative power, alternative elections, an alternative system. A system is needed to fight another system, we suggested that way to him, but he did not want it and decided to go alone, choosing his way. The movements, of course, will continue but without Raffi,” said the hardliner. Hovannisian did return to Baghramyan Avenue late on Tuesday where after negotiations the police agreed to remove the cordons and let a peaceful march past the Presidential Palace with a subsequent return to Liberty Square for a “good night”. “Those who do not believe in victory should go home and watch soap operas, but those who do want to believe should stay in the fight,” said Hovannisian. Many political observers already estimate that the Heritage leader, who staged protests in Yerevan and provinces for seven weeks after the February 18 presidential elections, including a three-week hunger strike, has now found himself in a difficult political situation. On the one hand, he has managed to avoid deadly clashes similar to the 2008 post-election riots in which 10 people were killed. On the other hand, some of Hovannisian’s steps and decisions made on the spur of the moment appear to have disappointed many, prompting assumptions that the opposition leader has no clear political program or organized team. Hovannisian called on people to come to the next rally in Liberty Square on April 12 during which he said he would present his program, including in regards to the immediate goal of the local elections in Yerevan in which a bloc of parties supporting his movement is taking part. Meanwhile, observers say the turnout during Friday’s gathering will show what impact April 9 has had on Hovannisian’s ‘political future’.